I will be on the Tammy Bruce Radio Tuesday morning at 11:00 AM PT. I am scheduled to be on around 11:00 AM PT and am looking forward to another visit on her show. Tammy’s latest book is the New American Revolution. 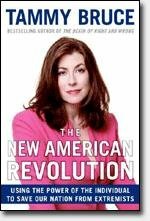 Tammy Bruce is another of the B-M-W‘s (blogger/media personality/writer) who is taking over the new media. Tammy is also a regular contributor on FOX News. Obviously, she is a very talented and busy woman. And… The Tammy Bruce Show is now online! …for a limited time anyway. You can check it out HERE from 9-12 PT. Update: Well that was fun! Tammy sure is easy to talk with and, of course, she is very well informed on the issues of the day.